Driving from South Carolina into Georgia gave me some beautiful scenery and time to reflect upon the past 87 days. Double-duty at the Flying J. And to find a Flying J to dump black water, top off with fresh water, gas up and get to the gig. You've got to plan these things accordingly or your self-sufficiency goes right out the window. Knowing your tank levels goes a long way towards being comfortable in your motorhome and also reduces the amount of crappy scents that can make their way from the holding tank below the bathroom right on up to the front of the rig. No drama at the dump station this time (I tested the water spigot first - yep, there's flow) as I multi-tasked and also topped off the fresh water supply while nibbling on the last of the oven baked turkey. About every five days or so, I need to be thinking about dumping the sewage, so I'm always on the lookout for options, especially in the northeast, where those seem to be fewer than other regions (besides out west, where you'd really better plan ahead.) If I take on propane as well, a stop at the truck stop can take 45 minutes or more, so I usually plan to take care of things like this on a travel day. A full house with full tables! 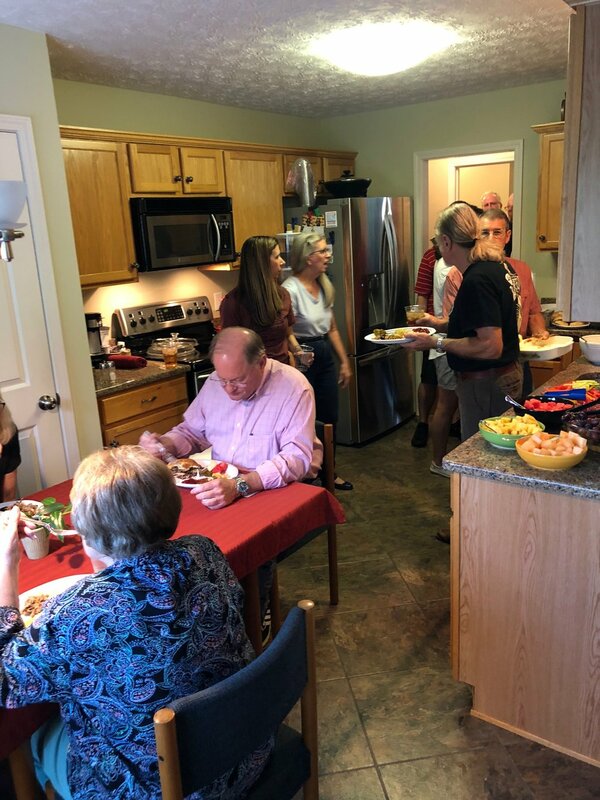 Still, with a planned stop, I arrived in Newnan, Georgia on time for the private house concert that would be final scheduled show of the tour. Ed and Melanie Atkinson saw me at the Walnut Valley Festival last year and have a house concert series that they invited me to. They attract a music-loving audience, serve dinner pre-show and deserts at the intermission and they're both die-hard music fans, supporters of the local and national arts. I could tell they were going to be a fun bunch while talking with some of the attendees before the show. Lots of musicians and educators. It had also been a week since I performed last and I was really pumped up to play. After seeing the concert space, I decided to use the Bose S1 Pro that I'd just purchased At Rick's Music World. The L1 Compact seemed like overkill for the job and I'd been impressed with the bass response of the S1 while testing it out. 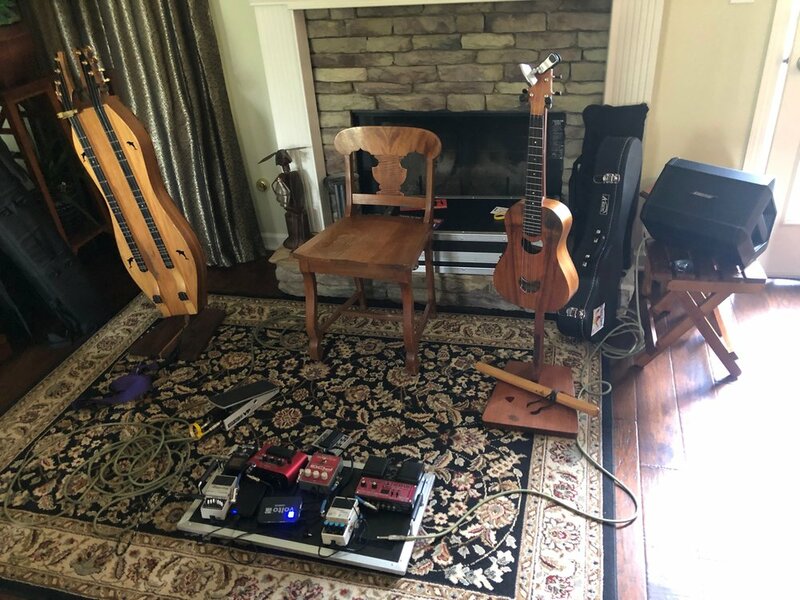 Turns out that, for the purpose of amplifying my pedal board just enough to make it seem acoustic, it worked far better than I could have hoped - and I eschewed a microphone since the room has such natural projection. It was a blast - they were an audience that I felt needed an introduction to the instrument, and they were an audience that didn't require a lot of set-up or explanation, which led to some wild, free-associating moments where I played fragments of songs and wove them into a story. Just crazy stuff like that - plus the usual "what's next?" vibe present at my shows. The Bose S1 Pro impressed in its very first show. It's always the most fun shows that go the quickest and, before I knew it, we were singing "The Mickey Mouse Club Alma Mater" and saying our goodbyes. It really couldn't have been a more perfect end to the tour - and they sent me on my way with barbecue pork and au gratin potatoes. Bonus. I'm always fired up after a show, just keyed, man - and after talking with The Atkinsons for a while, I departed and figured I'd drive an hour down to Columbus, stay there at Walmart for the night, and then get a fresh start on heading home in the morning. This has been simply the most incredible tour - THANK YOU to everyone who has been a part of it! I'll be back with the recap and the close of this marathon blog, which is definitely a personal best record, tomorrow. For tonight, I hope everyone goes to sleep with a smile on their faces.